M. Allen Cunningham has once again raised the bar on the art of the novel. I enjoyed Perpetua's Kin as one would a rare smoky scotch - savoring the complexity, as well as the inherent skill and time needed to bring the effort to full maturity. The book clearly succeeds beyond an exceptionally rich piece surrounding the Civil War. Storylines such as this resonate because they remind us how important our personal histories become for those who follow us. Perpetua's Kin may be a distinctly American portrait, but the overarching themes - war, love, wanderlust, suffering, are quite universal. I always walk away from a reading like this ruminating on the largeness of life and the lasting impact of the arts - the lasting influence that novelists can have on every one of us. The author of the much-acclaimed #1 Indie Next Pick The Green Age of Asher Witherow returns with a masterful new work, epic in scope and yet intimate in its emotional power, about a family shaped as much by tumultuous world events as by each of its members' long-kept secrets. Benjamin Lorn, sensitive son of an embittered Civil War veteran, comes of age in the tiny Iowa town of Perpetua where, in a single summer, he mourns the recent loss of his mother, falls in love, and uncovers a shameful family secret that sends him fleeing west. Tormented with this new knowledge, Benjamin seeks transcendence through the telegraph wires that have enchanted him since boyhood. Meanwhile the weight of a dark duty grows more and more pressing. 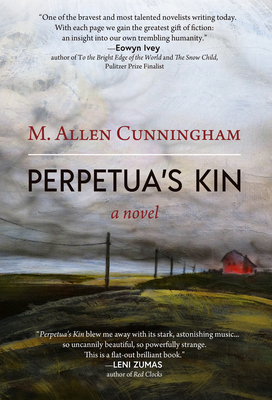 Thus begins Perpetua's Kin, M. Allen Cunningham's enthralling multi-generational mystery, reworking of Hamlet, and profoundly contemporary exploration of the American experience as one family embodies it. Spanning much of North America over more than a century, from the 1820s Midwest through the American south of the Civil War, to World War II San Francisco, Cunningham's novel is a powerful portrait of this nation's violent heritage, our vulnerability to the vastness of our own geography, our chronic restlessness and desire for regeneration through technology, and the impossibility of escaping the history that forms us and, always, demands a reckoning.